Lots of different types of materials can be used to cover a lean-to roof. Conservatories, carports and covered ways are often covered with corrugated translucent plastic sheets which allow natural light through. They are easy to fix; light in weight, making them easy to lift and manoeuvre; and require a rela­tively small supporting framework. The sheets are available in a variety of col­ours, profiles and lengths and weights. Lean-to garages and sheds are often covered with corrugated sheets made of asbestos cement or galvanised iron. Iron is usually used only when the roof is out of sight. Asbestos cement is often used because it is fireproof. But it is heavy, needs a strong structure to support it and is also relatively fragile it needs careful handling when new to avoid damaging it and with age it becomes brittle and easily broken. Never attempt to walk directly on an asbestos roof always use a crawl­ing board. The modern substitute for asbestos cement is cement fibre. Water dripping from the underside of a lean-to roof covered with plastic, asbes­tos or galvanised iron sheeting does not necessarily mean that the roof is leaking the drips may be due to condensation. But if the drips occur only when it is raining, a leak is the likely cause. Three areas of a lean-to roof are particularly troublesome – flashings, around fixings and at overlaps. The joint between a lean-to roof and the house (or building) is sealed with a flashing strip. If this joint leaks, make sure the flashing strip is securely fixed to the house and to the corrugations of the roofing sheets. If the flashing is loose in the brickwork, it should be rewedged and repointed. If it is torn or split, it is usually simpler to replace the strip than to water­proof it. 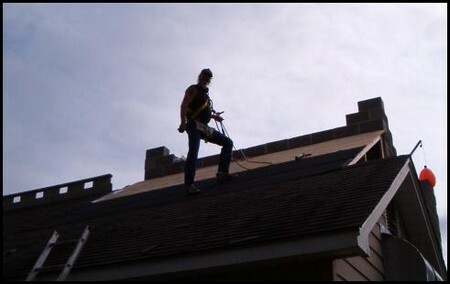 Self-adhesive flashing – which sticks to both roof and wall – is easier to use than conventional flashings. Each roofing sheet is fastened to the roof timbers by nails or screws through holes drilled in the ridges of the sheet. A rubber or plastic washer beneath the head of each fixing stops rain-water getting through. With age, these washers some­times get brittle and split, allowing water to run down the fixing. The only cure is to remove the fixing and replace the washer. Each roofing sheet should overlap its neighbour by two corrugations. If plastic roofing sheets are not adequately sup­ported, they will eventually bow and no longer mate sufficiently well with their neighbours to retain watertight joints. This can be cured only by introducing more supports. Galvanised iron sheets will eventually rust unless they are given a protective covering of a bilumaslic-based paint. Once a sheet has perforated through rust, the only permanent cure is to replace the sheet with a new one. Temporary repairs can be made with a bitumastic scaler. Asbestos cement becomes brittle with age and will split if it is knocked. Again, bitumastic sealer can be used for a temporary repair, but broken sheets should be replaced.